The idea for the Polychrome Historical Haggadah came from the Polychrome Bible, an edition of the Hebrew scripture that “was put out in the early part of the 20th century in order to show the documentary elements according to biblical scholarship,” Rabbi Zahavy said. “It was a brilliant idea. “Of course it’s a heretical idea to say the Torah was the product of different documents, since according to Orthodox theology it’s one unitary document. The Torah is Moshe Rabbeinu’s Torah. But the world of scholarship decided to go out and investigate the Bible from a historical perspective and came up with the documentary hypothesis” — that the Torah was a composite of four or so different texts stitched together by an editor. 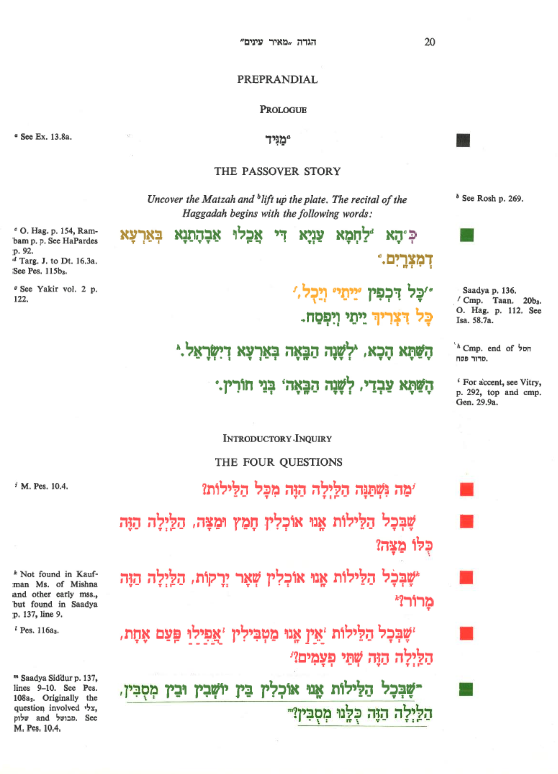 Rabbi Zahavy came to the polychrome concept when he was studying the prayer book. Rabbi Freedman, ordained by the Jewish Theological Seminary of America, led several Conservative synagogues. He was 71 years old when his Haggadah was published in 1974; he died 12 years later. Rabbi Freedman assigned the copyright to his book to a foundation he created. The foundation subsequently was dissolved, leaving the copyright in limbo. Rabbi Zahavy scanned the pages of Rabbi Freedman’s original work, and he wrote an introduction to it. 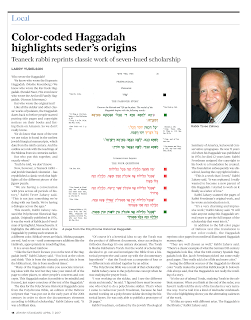 In addition to the full color pages of Hebrew text (the translation is not color-coded), the Haggadah reprints color pages from medieval illuminated Haggadah manuscripts. 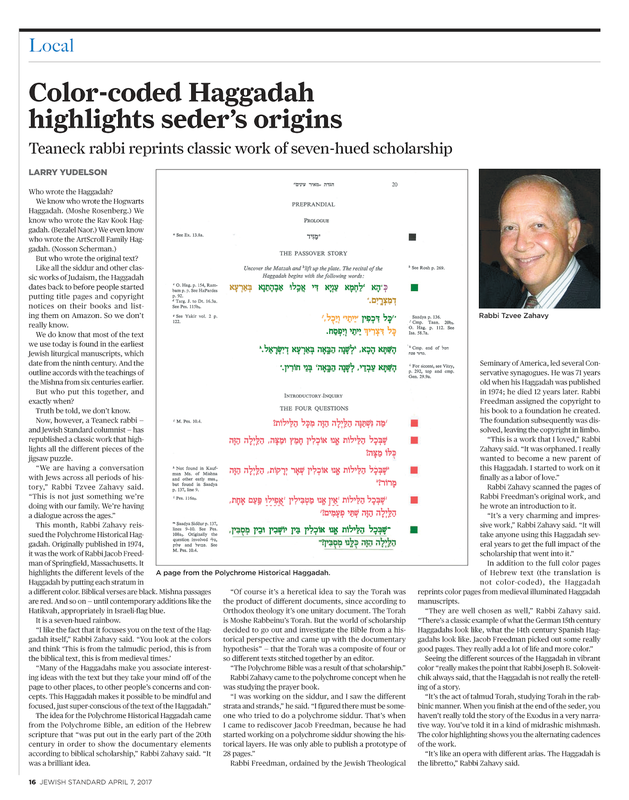 Seeing the different sources of the Haggadah in vibrant color “really makes the point that Rabbi Joseph B. Soloveitchik always said, that the Haggadah is not really the retelling of a story. “It’s the act of talmud Torah, studying Torah in the rabbinic manner. When you finish at the end of the seder, you haven’t really told the story of the Exodus in a very narrative way. You’ve told it in a kind of midrashic mishmash. The color highlighting shows you the alternating cadences of the work. “It’s like an opera with different arias. The Haggadah is the libretto,” Rabbi Zahavy said.